The disputed land territory involves a slice of coastline at the northern tip of Isla Portillos, an island located in the delta of the River San Juan de Nicaragua (Isla Portillos is sometimes considered part of the larger Calero Island). The border once ran along the river and into a lagoon before hitting the Caribbean Sea, but a hundred years of natural changes to the area's geography messed that all up. In this court case - the latest of several between the two countries - Nicaragua claimed that a tiny channel of water still connected the river to the lagoon, separating a narrow strip of Nicaraguan coastline from the island's Costa Rican interior. But Costa Rica argued that the channel, if it even existed, had been artificially built by Nicaragua, and that the Nicaraguan sandbar that once did exist had long ago eroded away. In this view, a small Nicaraguan military camp on the beach - recently moved from the mouth of the lagoon to a spot slightly farther west - was an illegal occupation of Costa Rican territory. Costa Rica admitted that the lagoon itself, and the piece of beach now separating it from the sea, still belonged to Nicaragua, leaving a tiny piece of Nicaraguan territory separated from the rest of the country. Even so, Costa Rica warned that Nicaragua might even lose all of that if the beach erodes away completely (international law doesn't normally allow a country to claim a body of water without owning some piece of land next to it). Judgement Day: Who Owns the Beach on Isla Portillos? When it released its decision this yesterday, the ICJ agreed with Nicaragua that the status of the disputed territory hadn't already been decided by earlier court rulings. But in the end the judges sided almost entirely with Costa Rica, agreeing that the beach between the lagoon and the mouth of the river are Costa Rican. In a decision made by a vote of fourteen to two, Nicaragua was left with just the lagoon and its short strip of beach, and was ordered to move the military camp off of Costa Rican land. 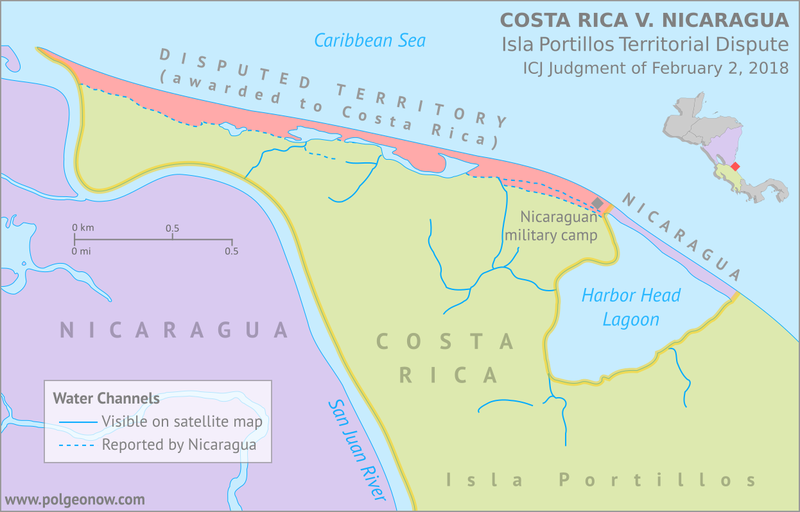 In an unusual move, the court also decided that the sea just outside of the lagoon would be Costa Rican waters. Normally, any coastline controlled by a country automatically gives it the rights to at least some of the neighboring waters, and denying that to Nicaragua might turn out to be controversial. The tale of the Isla Portillos dispute goes back almost 200 years, involving a US president, a Confederate general, and a lot of creative geographical analysis. Costa Rica and Nicaragua declared independence from Spain together in 1821, and went their separate ways after the Federal Republic of Central America fell apart in 1838. But from early on, they scuffled over exactly which land belonged to which country. In 1858, they set out to end the disputes by precisely defining the course of their border in the Cañas–Jerez Treaty of Limits. That treaty set the right bank of the San Juan River as the border in the Caribbean coastal area, with the boundary ending at a spot called Punta Castilla by the river's mouth. After bringing in US President Grover Cleveland as a mediator from 1886 to 1888 to settle remaining disputes over the treaty's validity, plus the exact location of Punta Castilla, the border seemed to be settled once and for all. >Only one problem: Rivers change course over time. By 1896, when the Costa Rican and Nicaraguan governments set out to actually mark their border with pillars on the ground, the end of the San Juan River had split into three separate channels, hitting the ocean kilometers apart from each other. Naturally, each country chose whichever border interpretation gave it the most land, leaving the intervening islands disputed once again. Click to enlarge: Map of General Alexander's 1897 border decision, and the Nicaraguan and Costa Rican claims of the time. The largest island, cut off by the Taura Branch, is Isla Portillos. Public domain illustration (source). Still, it was no surprise that some disputes would come up in the process of marking out the border, and that's why they had another third-party mediator on hand. Grover Cleveland - US president again after a break from 1888-1893 - couldn't participate in person, so instead he sent his friend Edward Porter Alexander, an engineer and former Confederate general from the US Civil War. General Alexander decided the border should run as close as possible to the original Punta Castilla spot, now located at the northeastern corner of Harbor Head Lagoon on the San Juan's middle channel. 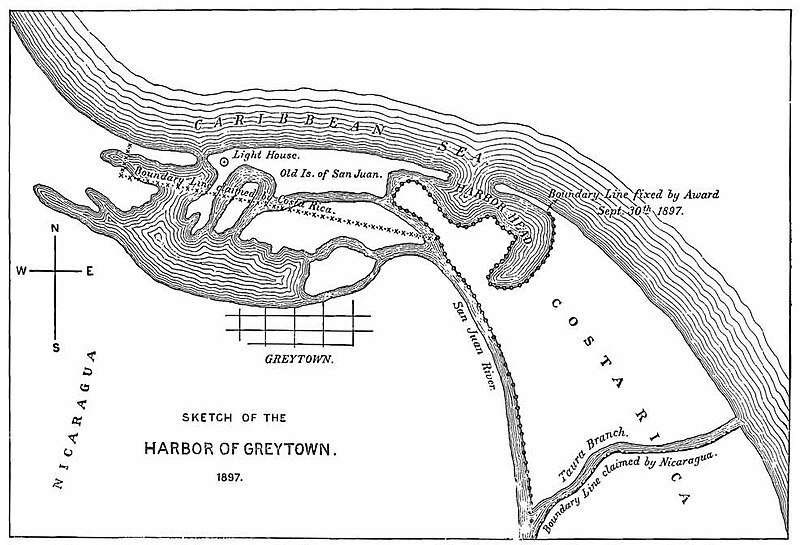 Realizing the river's course would keep changing in the future, Alexander specified that the future border should always follow the east side of the lagoon and then continue up "the first channel met" into the San Juan River proper. Alexander's solution continued to work for about a century. But over the decades Punta Castilla was swallowed by the sea (its original location now lies about a kilometer straight out to sea from the edge of the lagoon), and by the 2000s, another problem had come up: Harbor Head Lagoon wasn't connected to the San Juan River at all anymore. Or was it? Nicaragua claimed it had found a tiny channel through the forest connecting the lagoon to the river even more directly than before ("the first channel met", remember?). This left the whole northern tip of Isla Portillos, roughly from the lagoon westward, as the supposed territory of Nicaragua. The dispute came to a head in 2010, when a Nicaraguan military commander infamously used Google Maps to argue that his troops had the right to land on Isla Portillos and begin dredging operations there. Costa Rica took Nicaragua to court at the ICJ over its actions, and in 2015 the judges agreed with Costa Rica: The newly-claimed channel wouldn't fly, and the Nicaraguan troops would have to leave. Costa Rica took this to mean the entire island was Costa Rican, except for the lagoon, which was directly mentioned in the border treaty, and the strip of beach that now separated the lagoon from the sea. But the court made a point of not drawing exact borders, and took a pass on saying who owned the island's narrow coastal strip. Soon, Nicaragua began arguing that a tiny piece of the original river channel still ran just behind the beach, connecting the lagoon to the present river mouth. Costa Rica insisted the strip of Nicaraguan land north of the channel had long ago eroded into the sea, and there was only a "channel" remaining behind the beach if Nicaragua had dug a new one farther back. In 2017, Costa Rica took Nicaragua back to court over the disputed strip of coastline, and yesterday the judges again took the side of Costa Rica, by a vote of fourteen to two. They concluded that there is no more channel, and that the whole beach is Costa Rican except for the part directly between the lagoon and the Caribbean Sea - now a tiny enclave of Nicaraguan territory separated from the rest of the country. "The house of hope is built on sand..."
Need ALL the details? You can find complete documentation of the court case on the ICJ website: records for the Isla Portillos case here, with the judgement and related documents here.